We live in a complicated world today that is increasingly more specialized. This extends even to the home with its many rooms and many pieces of furniture, each with its particular function. It can be hard to imagine a much different time, say five or six centuries ago, when people's homes were likely to consist of only one or two rooms with three or four pieces of furniture clustered within their narrow confines. The area of clothing storage is particular telling, since we have evolved from using hollowed tree trunks with rude lids to our present collection of closets, dressers and related pieces. Of course, there was a very good reason for using hollowed tree trunks at that earlier time--clothing storage was only an issue at night when you wondered whether to leave your one outfit on the chair or on the floor. I think almost all of us prefer today's clothing choices to those of yesterday. In celebration of how far we have come, let's look at the history of clothing storage. The first storage furniture was the coffer or low chest. It was nothing if not versatile, serving as seat, storage and occasionally even bed. Some of the oldest chests, dating to the Middle Ages, can still be seen in European churches where they are used to store vestments and documents. While the earliest examples were constructed from tree trunks, this soon gave way to the lighter and more versatile method of using six boards nailed together or held together with dowels. With the end boards extended a bit, simple legs could be fashioned to keep the chest off the floor and away from the damp. This very functional chest style, often richly carved, was used by country craftsmen until the 18th century. Oak was commonly used because it was durable and plentiful. The problem with this construction was that the boards shrank and warped with time which pulled the wood away from the nails. The chest usually had at least one strong lock since the contents reflected all of a person's worldly possessions. Some chests had several locks. Those in churches commonly had three or more. Security was further enhanced by distributing those three keys among three people who would all have to be present for the chest to be unlocked. If security was really an issue, a chest would be constructed that was encased in iron or bound with iron. Panel and frame constuction was introduced into England from Belgium by the end of the 15th century. This allowed for panels to be fitted into grooves on the inside of frames secured by the mortise and tenon joint (basically a joint secured by a peg). The panels were thus allowed more room for movement which meant the wood no longer split around the nails. It also meant that the quality of workmanship increased since a piece had to be planned beforehand and constructed skilfully so that the joins could be made. Crudely made drawers first appeared about 1600. They were an inevitable evolution since the biggest limitations of storing clothing in a chest were that access to items lower down was inconvenient and creasing was common. When people had few personal possessions this was fine, but as wealth and living standards increased, a more efficient solution was needed. Early drawers were called tills or drawing boxes and at first were built into the base of the chest. Drawers from this era featured grooves cut along both sides which fit with projections inside the frame. Such chests were termed "mule chests" because of their mixed parentage of drawers and chest. By the early 17th century, mule chests were common in England. They featured drawers either in the base or extending halfway up the chest. The top half of the chest was reserved for the chest compartment. By the mid 17th century, a natural evolution was occurring. Mule chests were being replaced by chests of drawers as people began to need more storage space for small items of clothing. These chests of drawers were not what we know today by the same term. They had two doors covering the drawer fronts. Bun feet were common though it is estimated that as much as 95% of them are replacements since most were made from walnut which is susceptible to woodworm and rot. By the time of the Restoration (1649-1660) the chest of drawers was established, but the common chest lived on and would for at least another century, especially in rural areas. The great acceptance of new methods of furniture construction was hastened by the Great Fire of London in 1666 which, according to J.C. Timbs' 1868 book Curiosities of London, destroyed 13,200 houses and 460 streets. Many people lost everything, and so the need for new futniture was very great. A rough version of the dovetail joint with three dovetails to slot together drawer corners had been in use for almost a century. This method of joining attained widespread acceptance with its greater refinement into five or six dovetails. It was named because of its resemblance to the shape of the bird's tail. The term "cupboard" first appears in the late 17th century, referring to a piece of furniture with inside shelving covered by doors. Prior to this, in the Middle Ages, cupboards were called "aumbries." The origin of this word appears to be either from the French "armoire" (originally developed to hold a Frenchman's armor and plumed hat) which was anglicized to "aumbry" or from the English "almery" which referred to the practice of storing leftover food in the cupboard to later be given as alms to the poor. This was replaced by the term "press" by the early 17th century. Cupboards were employed for a wide range of storage uses, from food to clothing. For clothing storage, oak cupboards were replaced by the chest of drawers by the Restoration. Case construction, also known as carcase, was introduced about this time. It consisted of flat panels of woods dovetailed into one another and veneered with another wood. The underlying wood was still oak, or pine in the Americas, but the veneer was usually walnut. Marquetry was introduced into England by Continental craftsmen during this period. Marquetry refers to the practice of using different colours and/or types of wood to form a pattern or picture. The Dutch, especially, were very skilled at floral marquetry. By 1700 it had passed from vogue, but veneers were starting to be used more imaginatively to incorporate wood grain into a design. The next development in storage was the elevation of chests and chests of drawers onto stands so that the lower drawers were more easily accessible. These are called highboys in the U.S. The earliest examples, during the reign of Charles II (1660-1685) had twist-turned legs. By the reign of William and Mary (1689-1694), peg top legs with curved stretchers were being used. This yielded to the cabriole leg. The tallboy was an extension of the chest of drawers on a stand. Basically, it was a chest of drawers over another chest of drawers. The great advantage was conservation of space, but the upper drawers must have been very inconvenient to reach, even requiring a chair for some massive examples. By 1730 the tallboy had become a Georgian household mainstay. It had replaced the chest of drawers on a stand and would remain popular until the end of the century. Some tallboys could even be separated into two for transport. The only serious rival to the tallboy was a grown-up cousin of the old cupboard--now called a wardrobe, clothing press or armoire. Design books of the time show sketches of many such pieces. Late Georgian wardrobes had a shelved upper section that was covered by two doors and a lower section with drawers. Bigger wardrobes had flanking wings on each side behind which clothes could be hung. American and Canadian settlements were not oblivious to the furniture fashions of the mother country. There was always a small proportion of wealthy colonists who could afford the latest English or Continental furniture style. For the most part, simpler forms of furniture predominated because of their affordability and because most of them were handmade by not always skilled craftsmen. Box chests with two or three full-length drawers were popular. The American versions tended to be painted. In Upper Canada, the blanket box (basically the little-changed storage chest) was very widespread. Trestle-ended, lapped board construction held together with nails was an easy form for the inexperienced craftsman to duplicate. Hinged tops were not universal, which made construction still easier. Framed and panelled chests, so popular in England in the 17th and 18th centuries, were not often constructed in Upper Canada. The chest on chest was rare. Despite the usually simple construction methods for furniture, though, decorative ability was displayed through the use of figured woods or simple carvings on legs and feet. There are outstanding examples of workmanship from this period, which reflects the immigration of cabinetmakers from Europe. 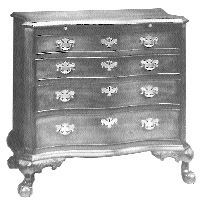 Upper Canadian chests of drawers reflected the influences of the German, Scottish, Irish and English craftsmen who were the first settlers. American influences were further spread through the emigration from the United States of the Loyalists and of the Pennsylvania Deutsch. In the Pennsylvania area of the U.S. especially, the Chippendale and then the Neo-Classical influences were strong. In the early 18th century, the Upper Canadian makers also drew on the latest Empire and Regency influences from Europe with greater and lesser degress of success. The hardwood available in the area included cherry, maple, oak and walnut, all of which offered creative opportunities with grain. Highboys were very popular in the U.S. during the 18th century. The American armoire, or wardrobe, was a functional adaptation by Pennsylvania colonists who lacked closets and light interior partition framing because their houses were made of stone. Large wardrobes were thus used as closets. 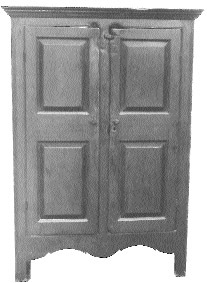 In the 1730's the chifforobe was developed--a combination of a chest of drawers and wardrobe that featured a divided storage area behind doors. There were drawers on one side and a hanging area with clothes rod on the other. Regular chests of drawers were still popular in England for smaller storage needs. By about 1740, the walnut preferred for their veneer began to be replaced by mahogany because the European supplies of walnut were getting depleted. The age of colonialization had opened, and suddenly there was literally a world of new products waiting to be used by the mother countries. The mid-18th century preoccupation with all things Oriental resulted in lacquered "Japanned" chests of drawers. The French Rococo influence of about the same time contributed to the curved serpentine front. The Neo-Classical movement towards the end of the century led to bow-fronted chests of drawers, a simpler version of the Rococo. The elegant simplicity of the Classical style would prove popular for 100 years, lasting well into Victoria's reign. The straight-front chest, too, was a timeless favourite. The upper and middle classes purchased them in mahogancy while the working class bought them in pine, now easily imported from North America. By 1820, late in the Regency period, brass plates and pull handles on chests of drawers were being replaced with the wooden knob. A craftsman of the time claimed that "wooden knobs harmonise [sic] better and do not tarnish." The Victorian era wardrobe evolved from the linen press with its drawers underneath which remained in use well into the 19th century. The full-length Victorian wardrobe had doors extending from top to bottom, often with mirrored plates. The shelves and trays that used to be inside were sacrificed to hanging space. The wood used by English furniture makers went through phases which were dictated both by supply and by public taste. The most common wood was oak because of ready supply and durability. This wood was especially preferred by country craftsmen who could not afford to indulge in the extravagance of exotic woods from afar. Walnut came to be used by the early 17th century, especially for finer furniture, though its susceptibility to worm attack and its less durable nature have not left as many surviving pieces of walnut furniture as there is of oak. Walnut was also a popular veneer. It was grown in England, on the Continent and in North America. 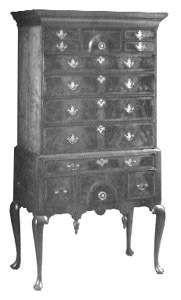 By 1750, the supply of walnut was diminishing, and mahogany was increasingly used as a veneer on case furniture. Mahogany was imported from the Spanish West Indies and Cuba. It was popular until the time of the First World War. With the advent of marquetry in the late 18th century, the lighter satinwood found favour as a veneer, since it provided a more suitable background for the rich inlaid designs of other woods. Satinwood is a light golden yellow when new and mellows to a honey shade. The Regency period, c.1800-1830, favoured the rich deepness of rosewood from Brazil. It is dark brown streaked with black and was a rival to mahogany until about 1860. By 1850, walnut had again come into fashion as a veneer for large furniture. In the Americas, pine was always a popular and inexpensive wood of choice for the lower classes. It was often painted which has helped such pieces to survive. Many suriving pieces of furniture that were originally made to store clothing are being used again today for the same purpose. blanket chest are an especially popular category. Elaborate peiod pieces such as highboys and finely constructed chest of drawers are used today as well, but there are not so many fine examples around that everyone can enjoy them. Perhaps it is because of the chest's functionality and affordability that it continues to be cherished by many. The most timeless pieces of storage furniture today is what was developed in the beginning: the chest in all its utter simplicity.